An aberrant tongue posture is when it postures between the teeth during the swallowing act. The tongue positions between the teeth as a hyper active muscle accommodation when there is insufficient intra oral pharyngeal volume for the human to do the swallowing movement. Thus, nature’s adaptive mechanism to compensate for what the teeth are now NOT ABLE to do properly when the bite is overclosed…that is, to support the masticatory system (which includes proper head posture, body posture, joint posture, muscle posture and even swallowing posture. This means the teeth/dental arches are not in a supporting position or location to more ergonomically function with diminished extra muscle activities to do these aberrant swallowing acts 2000-3000 times daily. WHAT IS A NORMAL SWALLOW? WHAT IS AN ABNORMAL SWALLOW? Shoulders lift, head extends the throat and compensates in a forward position, tongue shims itself abnormally between the teeth in that instant in time as a soft splint to accommodate the lack of intra oral space to accommodate the lack of tongue which should be present but is not when swallowing. 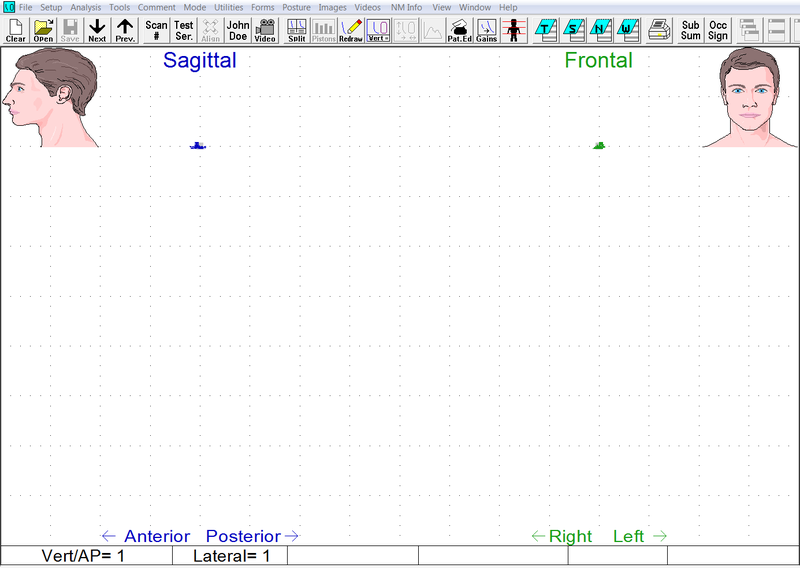 The above jaw tracking functional swallowing trace using Myotronics K7 Scan 6 shows an aberrant tongue pattern with 3 mm of tongue space between habitual CO position and the aberrant swallow. 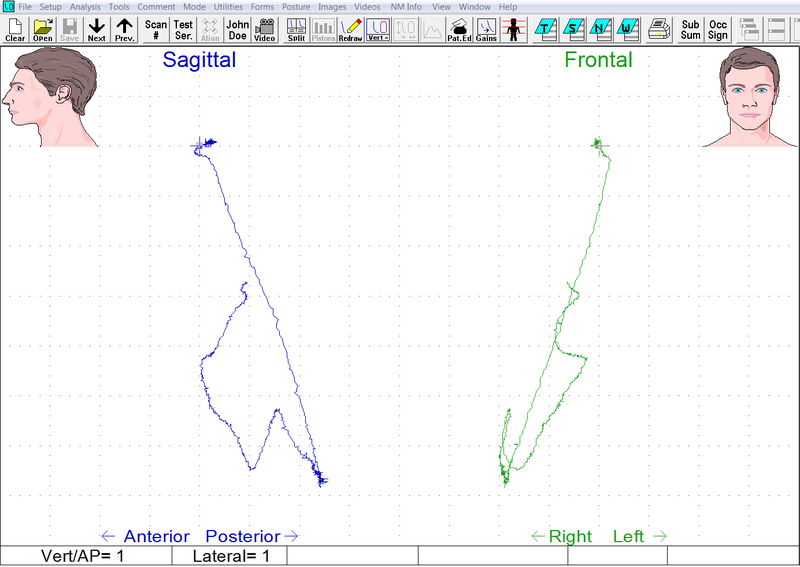 The above jaw tracking functional swallowing trace using Myotronics K7 Scan 6 shows a normal swallow pattern with teeth bracing against teeth at their habitual CO position. No aberrant movements away from CO is observed. The swallowing mechanism has to work hard then designed. It is in those moments of time the body is over working (yet in some folks they adapt and don’t feel anything bad is happening or abnormal) while the slow but sure gentle consistent tongue forces in others day and night are slowing working orthopedically to create over time depressed curves of Spee, bicuspid drop offs on the lower arch, lingual tipping teeth, narrowing of arches, posteriorization of mandibles and loss of vertical dimension in contributing to increased mentalis crease (facial 1/3 lower). Dental arch forms are dictated by normal versus abnormal swallowing muscle patterns. Abnormal hyper active muscles will contribute to contracted, narrow, over closed forms. Physiologic health swallowing muscles will contribute to well rounded full developed arch forms. On panoramic x-rays we see gonial notching develop (hyper muscle activity of masseter muscles contributes to excessive boney growth), condyle bent at their necks, condylar heads in an superior posterior position, and CBCT imaging also shows decreased intra oral pharyngeal airway space. (this is abnnormal boney evidence of abnormal muscle activity)…but rationale logic doesn’t seem to put these pieces forensically together since objective functional EMG and CMS measurements are never once considered in rational thought of scientific inquiry. This is what clinical evidence has shown. Scientific measurements using technology shows that when tongue is functioning between teeth the body has to exert more muscle activity than those cases that have sufficient intra oral tongue space to swallow with teeth bracing against the teeth (this is healthy, physiologic). This mode of understanding goes beyond the realm of “feelings” or rational logic and thought. Objective measurements using jaw tracking and functional EMG data demonstrates this clearly. Rationale minds and feelings do not really want to know the bio-physiologic functional evidence of the clinical pathologies observed and documented in both dynamically and static forms…or do they? Rational thought doesn’t want to believe that teeth in their idealized position should actually be the supporting mechanism (in the final analysis) to support healthy stability of body posture and function, not acrylic splints and aberrant pink tongue muscles!